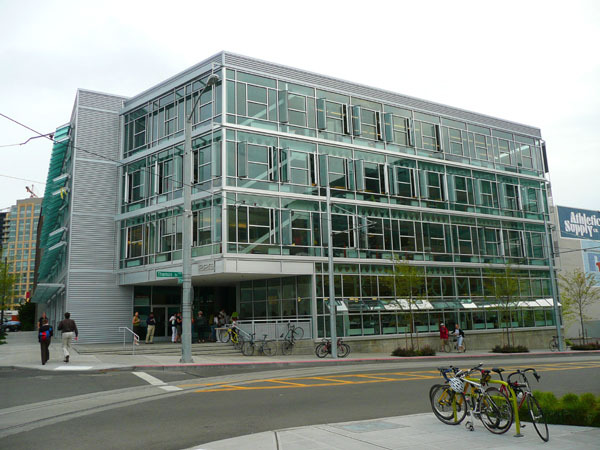 This is the Terry Thomas, Weber Thompson’s new 40,000 sf office building in South Lake Union. It has no air-conditioning. That is, it’s the first significant office building without air-conditioning to be constructed in Seattle for perhaps half a century. NBBJ wanted to do this at Alley 24 but the developer got conservative and decided against it at the eleventh hour. 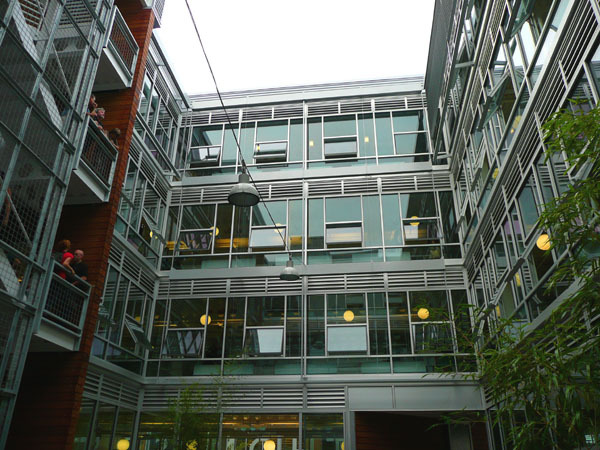 Terry Thomas is a donut (courtyard in photo above), which enables optimized passive ventilation as well as copious daylighting. It has 248 operable windows, along with a variety of computer controlled louvered vents and shades. It is heated with a natural-gas fired hydronic system, a.k.a. hot water radiators. They expect to achieve at least a 30% reduction in energy use compared to a typical office building. In Seattle’s climate, relatively few building uses couldn’t get by without air-conditioning in a properly designed building. And when you consider the dual challenges of climate change and peak oil, it seems almost criminal that status-quo buildings continue to go up. Someday buildings like Terry Thomas will be the norm, but the further away that someday turns out to be, the more pain we’re all going to feel in the long run. Maybe there oughta be a law? Posted by dan bertolet on	Wednesday, September 3rd, 2008 at 11:16 pm. You can follow any responses to this entry through the RSS 2.0 feed. You can leave a response, or trackback from your own site. The problem is the heating and cooling, right? Seattle actually does have a law against installing new water-cooled air conditioning I learned recently (during a server room remodel). I’m impressed. this seems to be a really nice building by an architecture firm that has in the past done some really bad buildings (at the expense of a great writer). I’d like to propose that we give this building the same scrutiny given the Seattle Public Library. Both buildings are technical wonders but how do they work for the public? How do people interact with it from the street? Has it successfully integrated with the pedestrian experience? Is it a good neighbor? What does it bring to it’s community? I have not been to this building but know people who have been to it. They all marvel over it’s technical strengths but I haven’t heard anything about its “social” strengths. If any of you have been there could you please include comments on topics that we have raised about other buildings to get a sense of its overall qualities? Harbor Steps doesn’t have a/c. In the summer western facing residents have to leave their units because they absorb so much heat. These are the most expensive units, and their renewal rate is below the other units average. Interesting about the Harbor Steps. The west side here presents a real challenge with natural ventilation, as people generally want a large amount of glass to get nice views. The result is that the solar gains are much higher than you can address using natural ventilation. Overhangs can help this issue, but then low western sun can be horizontal – meaning even an overhang won’t fix the problem. How do you get around this? Europe uses external blinds. Another solution is really good glass (very low SHGC). I’ve heard from many W+T employees that the building is almost unbearably uncomfortable. @2 Spencer: I did a tour here with Seattle Great City and I remember one thing they mentioned was how the building re-connected them with the neighborhood. With the big glass windows always open there is a much more direct connection of sight and sound both from within and from without. The courtyard is a nice feature that also blurs the lines between the public and private space here. I believe they are looking for a cafe-type rentee for part of the bottom floor which will also help increase this public/private interaction. @3 Bob, they have a little cove under the steps in the courtyard for bikes. I also believe there is bike parking in the below-grade garage, but I’m not sure on that. Quick question: Given all the (lot? little?) air pollution downtown, would it be OK to construct a sealed building that doesn’t use heating or cooling but does utilize powered, filtered ventilation? I’m just thinking of air pulled through a filter via a powered fan or something, and then a bunch of other design elements (other than operable windows) to eliminate the heating and cooling need. Put more simply: Is there some way to control and filter the air supply while still significantly diminishing the need for AC and/or heating? I ask because I live very near I-5 downtown and can’t help but notice the particle matter that has settled the windowsill since signing the lease many months ago. On a downtown arterial it’s probably not as bad, but it’d be nice to be able to breathe un- or less-polluted air in the office/home/whatever building. [AM], it’s not only possible, it’s a good idea. I’ve designed a few buildings with air handlers but no cooling (though we always have at least radiant heating in this climate). This allows for other nice techniques like winter heat recovery (transferring heat from your warm exhaust air to your cool intake air). It’s still a good idea to have operable windows for when it gets really warm out, but the design can work either way (ducts and fans get larger if you design for closed windows and no air conditioning). just 30% better? are you s******g me? that’s baseline. surely they could have achieved better than that. feck i miss the germans and their progressive views. holz, yes, I was wondering the same thing. It seems no A/C and daylighting and all the other little energy saving features that I assume are in the building would give them better than a 30% reduction. They may be intentionally going with a conservative estimate just in case things don’t go as well as they’d hoped. Or maybe it’s simply telling us that in this climate, the energy demand of A/C is relatively small? I know this might be a merely pedestrian observation after considering the sustainability/energy usage stuff, but I like the way it looks. Modern and stylish but simple enough to fit and not grow outdated in less than a decade. My kind of city building. [holz] and [dan], it’s actually quite difficult to get much past 30% savings in our region. Air conditioning only kicks on a small fraction of the year in this size building, and isn’t close to the major power user. Often it’s lighting that’s the major power user, and is the easiest way to reduce energy use (daylight dimming controls, reduced lighting power density, good lighting design that reduces the number of table lamps people need/use). Next on the list (by cost) is probably plug loads – computers, copiers, table lamps, space heaters (grrr), followed by ventilation fans. Somewhere in there (depending on the building design) is heat – which is most of our energy use but not as much energy cost (natural gas being cheap per energy unit even with our inexpensive electricity). LEED measures energy cost. I loved your writing, please do keep putting out more content like this! We just couldnt leave your web site before letting you know that we truly enjoyed the top quality info you supply for your visitors? Will be back again soon to check up on new stuff you article! I’d like to express, nice web page. I will be uncertain if it has been dealt with, when using Internet explorer I’ll certainly not receive the entire page for you to load with out relaxing numerous moments. Could just be the modem.